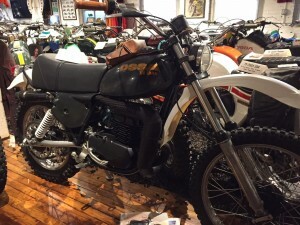 I looked at this Enduro bike about five years ago at Mike Gallagher’s house – we couldn’t come to terms. I beat the bushes the last couple of years to find another, but no one wanted to sell. Finally, Mike and I were talking, and he said he still had the black Six-Days. I made an offer and he accepted! The guy that previously had the bike had plans to compete in the ISDT but that did not come about. He changed the fenders and lamps to Preston Petty Parts, and the rear suspension to Progressive. Many thanks to Karl Heise and Al Snoop for sharing the parts to get it back to original!